Studies show women with acne have low estrogen levels and that estrogen protects against acne. Progesterone, in contrast, may aggravate acne. Estrogen dominance theory as cause of acne is not supported by evidence. Most of the research on the effect of hormones on acne has been focused on androgens, and there have been only a handful of studies looking at the role estrogen plays. 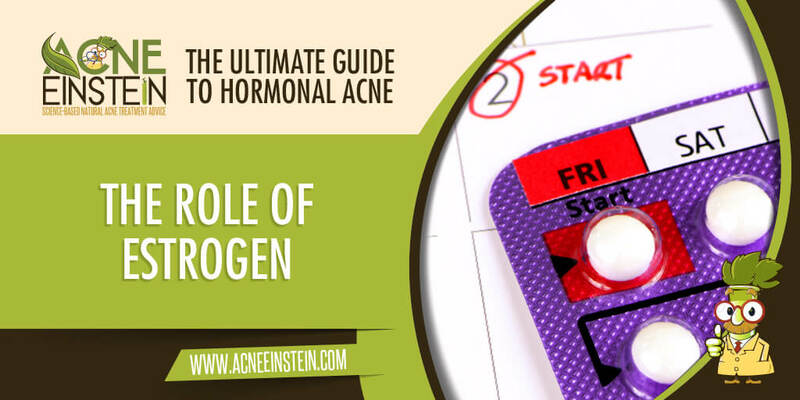 Regardless, most scientists believe estrogen opposes androgens and protects against acne. Unlike male hormone androgens, female hormone estrogens have a beneficial effect on acne that is why some doctors recommend birth control pills for women who have acne. Several studies comparing hormone levels between women with and without acne show that those with acne have significantly lower estrogen levels than those without (source, source). Furthermore, those with more severe acne tend to have lower estrogen levels than those with mild acne. Acne often gets worse during the part of the menstrual cycle when estrogen levels go down. Acne is the most common during puberty because of the low levels of estrogen and progesterone during the first few menstrual cycles. Treating male to female transsexuals with estrogen and androgen blockers drastically reduces acne and sebum production – the opposite is true for female to male transsexual treated with androgens (source). It’s well known that birth control pills reduce acne. For example, a 2014 paper that analysed 32 studies showed that the number of pimples dropped by 55% on average after 6 months on birth control pills. Birth control pills prescribed for acne include both estradiol (estrogen) and progesterone. A recently published study showed that regularly eating dairy products reduces estrogen levels, which could partly explain why eating dairy is linked to acne. Blocks acne and sebum boosting effect androgens have on the skin. Reduces androgen production in the gonads. Regulates genes involved in sebum production. Many alternative and natural health websites claim acne is caused by estrogen dominance. Allegedly, women who have estrogen dominance have too much estrogen in relation to progesterone, and this excess estrogen is claimed to lead to numerous health problems – including acne. I have never been able to find any real scientific evidence to support the estrogen dominance hypothesis. And when you consider that the majority of scientific evidence to date points to estrogen protecting against acne, it’s hard to take seriously the notion that too much estrogen causes acne. Time will tell whether estrogen dominance is real or yet another fictional diseases invented by alternative health proponents. So far there’s no reason to think it’s real. Progesterone is another female hormones that’s occasionally linked to acne. Two studies have shown that women with acne have higher progesterone levels than women without acne (source, source). Studies have shown progesterone supplementation can cause acne and, at least in older women, increase sebum production (source).